Millions of people killed in genocides around the globe were remembered by Broadlands Academy pupils as they observed Holocaust Memorial Day on January 27. The event, which first took place in 2001, aims to preserve the memory of those who suffered or lost their lives in the Holocaust of World War II, under Nazi persecution and in later genocides in Cambodia, Rwanda, Bosnia and Darfur, and to educate future generations. Holocaust Memorial Day falls on the anniversary of the liberation of Auschwitz-Birkenau in 1945, the largest Nazi death camp. 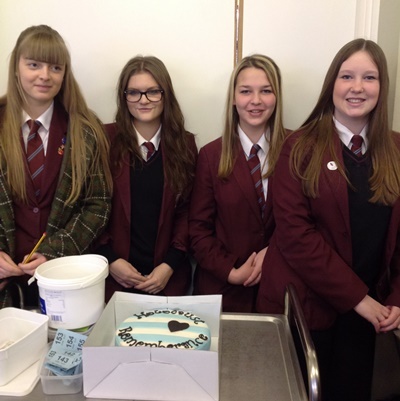 At Broadlands Academy, Year 9 students led an assembly on the topic for pupils in Year 7 and raffled a cake specially made for the day by a student’s grandmother to raise funds to create a memorial at the school. Humanities teacher Linda Clapperton said: “Around Holocaust Memorial Day (HMD) we honour the survivors of these regimes and challenge our students to use the lessons of these experiences to inform our lives today. “Year 9 students delivered a very moving assembly to Year 7 students. In addition we have held other events throughout the week, such as a non-uniform day and a cake sale.